Is It Good? 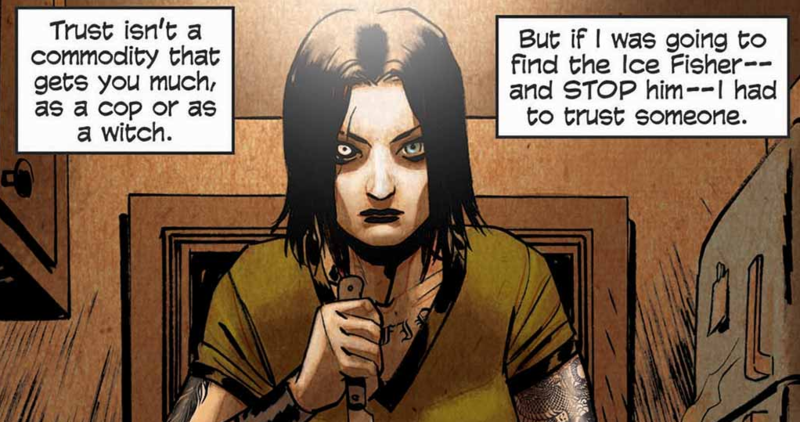 Coffin Hill #12 Review – AiPT! Eve is getting closer and closer to the finding out who the Ice Fisher is and the Coffin Hill witches are in big trouble. This is the second to last issue of the arc, so I’m curious as hell to see where this will be going. Is it good? Nate finally arrives at the prison holding Eve Coffin to warn her about the arrival of her brother and the danger she is. Of course, that danger soon comes a-calling. Back in the past, Eve may have a figured out a way to identify the cop/Ice Fisher with a little magic. However, she gets a bit of a surprise. Well that’s not a very nice valediction. I enjoyed Coffin Hill #12 more than the last issue and it has me excited for the arc finale next time around. It cuts down on how many people we are focusing on and what stories we are seeing, and as a result has a much better balance of tension and excitement. Sure, I still have absolutely no clue what’s going on with Lacey, but hey, it definitely feels like we’ve made progress. Caitlin Kittredge’s writing is fine as always, with some hiccups here and there. The characterization remains fairly strong and accurate for the characters, especially Eve. There are some events I’m still very shaky on since they haven’t been all that properly explained, like what exactly is going on with Nate and the conflicting information here and in the past about the true identity of the Ice Fisher. Also, I’m surprised Detective Lennie at the end is taking everything she just seen in stride. The dialogue is decent, though a few bits of narration sound off; the horror elements to the issue felt stronger, but still not as good as they could be. The pacing is fine, along with the storytelling and flow. The ending is quite interesting and does make me curious to see how this all ends, even with some of the confusion I have. This can only mean good things when the lights go off in a prison. Inaki Miranda’s artwork is appealing like usual, with no real changes in terms of quality. The characters look great, the layouts are excellent, the colors are pretty, what horror element exists are creepy, and all of that jazz; as with this month’s Hinterkind issue, Coffin Hill also has a Defy Cover, which features a cover that looks like a page right out of the comic. Dave Johnson does this Defy Cover and his work looks nice here; for the one page he does, he really gets how to draw horror and moody imagery. I wouldn’t mind seeing him do an arc or an one-shot issue for this series if he ever gets the chance. Coffin Hill #12 is a solid issue that is really heating up the story as the end for the arc approaches. The buildup is great, the writing is good, the characters are enjoyable, and the artwork is solid like usual. I am very intrigued and excited by where this comic could be going from here and hope it goes out on a spooky and creepy note.